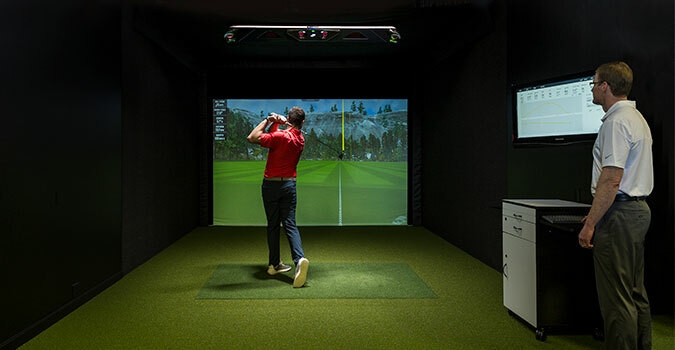 Each of our stores features multiple indoor fitting bays with state-of-the-art launch monitors and computer fitting software, along with fitting carts from all the leading club manufacturers. Our fitting specialists will utilize all the available fitting tools to find the best clubs for your game. Indoor fitting sessions are free of charge and are available on a first come, first served basis. The best of both worlds….all the benefits of Trackman 4 dual radar technology and the visual impact of 3-D down range ball flight on the Trackman simulator screen. Trackman 4 uses dual radar to provide the user with the greatest detail and accuracy of the club and ball at the moment of impact and during flight. The first radar system tracks everything the club does before, during, and after impact—including such key parameters as club path, face angle, swing direction and spin loft. The second radar system tracks the ball flight— including launch angle, spin rate and curvature. The Trackman 4 simulator environment allows the fitter to simultaneously show you all of your important club head and ball flight data as well as the 3-D ball flight trajectory from a variety of angles. The Trackman Optimizer uses your swing characteristics and launch conditions to provide the ideal range for your launch angle, spin rate, ball speed, shot height, and spin loft. 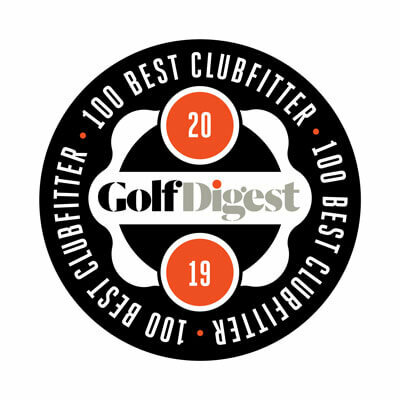 By trying a variety of different heads and shafts, the fitter will find the club that best fits your ideal range for these measurements to optimize your performance. The TrackMan 4 is used by a vast majority of the game’s leaders, from world-renowned coaches to top performing tour players to practically every golf equipment manufacturer in the industry. That’s no coincidence. Trackman 4 Simulators are available in our Greenland, NH, Hudson, NH, and Scarborough, ME locations. Simulator fitting sessions are offered at no charge on a first come, first served basis. Foresight Sports. The most trusted launch monitors in the world. The GCHawk™ is an overhead-mounted launch monitor that delivers a whole new level of freedom and flexibility. The key to its unmatched performance lies in state-of-the art object recognition and imaging technology. The GCHawk’s Quadrascopic optical sensor captures each and every shot with flawless reliability. Even from an elevated position, GCHawk™ delivers the same accuracy and shot-after-shot reliability you’ve come to expect from Foresight Sports. With its massive ball-capture range, the GCHawk allows both right and left hand players to hit shots with absolute confidence that performance was precisely measured. And just like its GC2 and GCQuad predecessors, the GCHawk captures shots from every stick in the bag – from the driver to the putter – for a complete, true-to-life experience. Indoors and outdoors, from coaching to club fitting to true-to-life golf simulation, Foresight Sports GC-line of launch monitors are the most trusted performance analysis solutions available. GCHawk simulators are available in each of our four stores. Simulator fitting sessions are available free of charge on a first come, first served basis. Come get custom fit like never before—with FlightScope Xi+, the world’s leading technology for 3D ball tracking. Pioneered from military training radar and industrial electronics technologies, FlightScope Xi+ measures true 3D data on ball spin (unlike cameras, which measure only one dimension). This unparalleled information allows us to more precisely custom fit you to the right clubs and balls for your swing. With the incredible accuracy of FlightScope Xi+’s spin rate measurement, you’ll be custom fit better than ever, and that’s key to posting lower scores. Available in our Scarborough, ME, location. Outdoor custom club fitting using the FlightScope Xi+ launch monitor is also available on the outdoor driving range in Greenland. Callaway Fits is a revolutionary new shaft analyzer that easily screws into the grip of a driver or seven iron. In just a few swings, this tool provides the best shaft options based off of a player’s swing DNA via Bluetooth right to the Fits App, which is downloaded on the fitter’s iPad. Our fitting specialists will be able to dial you in quickly to the best shaft options for your individual swing. Callaway Fits is available in all four of our stores. For more than 35 years, Cleveland Golf has been committed to creating innovative short game tools designed to help you score better and enjoy the game. This commitment has led to several breakthroughs in wedge innovation, including the latest—The Wedge Analyzer. In as few as two swings, you can now get accurately fit into the proper wedge bounce or sole grind. The Wedge Analyzer, powered by Swingbyte, captures the motion of the wedge throughout the entire swing, including the delivery into the ball just before impact. Using the golfer’s swing data and typical turf conditions, the Wedge Analyzer recommends the proper bounce and sole grind to optimize scoring. Also included is a database of pitching wedge lofts to help determine the correct wedge lofts for consistent distance gaps. Experience the Wedge Analyzer today! Available in all our store locations. Mizuno’s Shaft Optimizer was first introduced in 2010 – quickly becoming the favored iron shaft fitting tool of fitters worldwide. In just a few swings, the Shaft Optimizer records 40 critical data points that make up your unique “Swing DNA” to quickly and easily identify the perfect shaft, shaft flex, lie angle, iron model and set make-up that can immediately help you play better. Mizuno measures every shaft in-house to establish a map of EI curves – to which it matches the swing profiles. The new Bluetooth Optimizer enables Mizuno’s club fitters to capture swing data directly to the software – run from an iPad or iPhone. By adding a Gyro to the Shaft Optimizer’s existing strain gauges – Mizuno is now able to recommend a far more accurate lie angle than the traditional method of lie tape & strike board. The Gyro is able to measure the club’s swing plane in 3D space along with shaft dynamics ignoring face rotation through impact for a more accurate lie angle reading. Using a combination of the Gyro and Strain Gauges which run throughout the shaft – Mizuno is able to capture 40 data points from every swing. One age-old debate that Mizuno are keen to put to bed is that some fitters mistakenly think that the Shaft Optimizer is an alternative to a Launch Monitor. In reality, the Optimizer works hand in hand with a launch monitor at its very best. The Mizuno Shaft Optimizer is available in all four store locations. Come visit us in-store and work with our fitting specialists to find the ideal shaft for your iron play using the Mizuno Shaft Optimizer and our TrackMan 4 and GCHawk simulators.